UPDATE: The price has been changed to $220, to make the event more accessible to everyone. Three great classes and lots of fun, food and festivities! It is sure to be a memorable weekend! All proceeds go to support our troops. There are so many details and you will want to go to the event website to check it all out. I'll be in good company, as the other workshop instructors are Jenny & Aaron and Heidi Meyer. All of the projects we'll be creating have a 1940's feel and style. Personally, this is one of my favorite eras. Love the fashion, the style, the resourcefulness and of course the patriotism American women on the Homefront showed while so many men were away at war. The BEST part?? All of the proceeds will go to Operation Stars and Stripes, a non profit organization that supports our troops both home and abroad. For more information, to see all of the exciting details, and to register, CLICK HERE. We will be spending Friday together in Atlanta at the Country Living Fair. (perfect timing!) I know I've always wanted to go and never had the opportunity, so this is the icing on the cake! We will begin our Country Living morning by attending an exclusive coffee and breakfast hosted by Jen O’Connor and Earth Angels Studios. We'll meet the talented artists of Earth Angels and shop their delightful handmade arts and one of a kind treasures. Jen will have goodie bags and discount coupons for every attendee. On Saturday, grab your pearls, pin curl your hair and wear your loved apron. You will get to enjoy a day of blissful creating! The classes will conveniently be held at the Marriott Courtyard Buckhead. Lunch will be served, and there will be plentiful foods fresh from the victory garden. The day would not be complete without a Homefront mercantile, where sweethearts will offer their handmade wares and rationed supplies. You’ll feel like you’ve stepped back in time while being surrounded by vintage sweetheart memorabilia from the Homefront and old swing music tunes from the 40’s. Using an array of mediums and skill sets each class member will create their very own recipe scrapbook from scratch. Inspired by old fashioned cookbooks and kitchens, fabulous Golden Age advertising, and the soft pastel tones of vintage wallpapers and fabrics…this recipe book is a visual treat that may even be sweeter than the favorite recipes kept inside. Combining your love for paper craft, art journaling, scrapbooking, and baking, all together to make an artful album that’s sure to fill up with recipes that hold all the ingredients to a warm, loving home. From blooms growing beside victory gardens to Sunday hats brimming with millinery, American sweethearts adorned many things in their homes and clothing with beautiful flowers. Using new and vintage materials, we will be making a vintage inspired millinery bloom with delicate lace, netting, and lustrous pearls. This American Beauty can be pinned to an evening clutch or clipped to a special spot in the home to bring some of nature’s beauty indoors. Inspired by the romantic soldiers, sailors and airmen of the 1940’s, Let Me Call You Sweetheart is a fresh twist on the popular “Sweetheart Jewelry” that thoughtful servicemen would send back home to their wives and girlfriends during their WWII deployments. 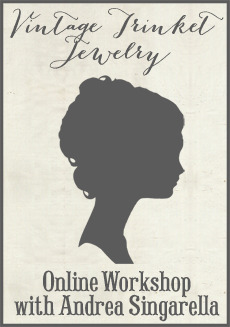 In this workshop, we will use basic jewelry-making techniques as well as wire-wrapping, to create a nostalgic necklace in beautiful shades of blush pink, antique gold and pearl. We will combine faceted Czech glass beads with shimmering glass pearls, vintage brass findings and gorgeous vintage rhinestones for some good old fashioned sparkle. The classic heart-shaped brass locket which dangles from a vintage “Sweetheart” stamping is the perfect place to keep a cherished photo of your love. Workshop kits will include everything needed to make this necklace just as pictured. Feel free to bring along any special beads and baubles you’d like to incorporate from your personal collection. Please bring jewelry pliers (chain nose and round nose) and wire snips. And of course don’t forget the most important part…. a picture or two of your sweetheart to nestle into the brass locket, so he’s always close to your heart! It is going to be a wonderful event, and I'm so honored to be a part of it! I'm looking forward to seeing old friends and making new ones! CLICK HERE to read all of the details and register. It's only $220 to register and will surely be a weekend packed with fun, friendship and of course creativity! I would love to see you there! It is recommended to go to the cleaners of the highest quality, because your money is precious. It is then washed off after it has settled for a few minutes. Mold is a common trigger for allergies which can be in carpets that hage been wet for a long period of time. An impressive share! I have just forwarded this onto a coworker who was conducting a little research on this. And he actually ordered me lunch simply because I stumbled upon it for him... lol. So let me reword this.... Thank YOU for the meal!! But yeah, thanks for spending time to talk about this subject here on your internet site. Nice post. I was checking continuously this blog and I am impressed! Extremely useful info specially the last part :) I care for such info much. I waas seeking this certain information for a lomg time. Thank you and best of luck. Hi, I do believe this is an excellent website. I stumbledupon it ;) I am going to come bachk once again since I saved as a favorite it. Money and feedom is thee greatest way to change, may you be rich and contknue to guide others.